Nokia provides 3 months subscription to use Nokia maps. Unfortunately, Nokia Maps cover few metro cities and so I was not able to explore it completely. But for the time I used it, it was simply great. Maps were detailed and GPS positioning was also accurate. Voice guidance was worth praising. I really liked it. Few months later I found www.phonelocator.mobi.This was not a navigation software but a tracking software. 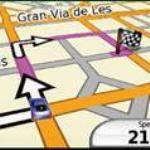 The software resides in your handset and with the help of GPS and GPRS , tracks your location on their website. You can keep your location viewable to all or just yourself. You can keep the track of yourself on maps. This was a very new concept for me. I used it for few days but the concept of publicly showing your present location was a drawback. I mean, I just wanted to share my current location with few of my friends and not the world. The latitude function allows you to invite your Gmail contacts to view your location on their computer or mobile screen. Your privacy settings can easily be configured. Recently Google latitude launched location history and location alerts. The location history maintains your location history whereas alerts lets you know when your latitude friend is near you or visits a new place via SMS or email. I have tested location history and it works perfectly fine. Although, I will be using location alerts soon once my friends agree to use Google Latitude. Oh, did I mention, Google latitude is free!!! Secondly, Google Latitude doesn’t works on low end phones. It doesn’t works on many Sony Ericsson and Samsung high end phones even. Well, you can view requirement on the website itself. Third is that It doesn’t support voice instructions.